Craftin' Caro: December's FREE Tutorial offer! 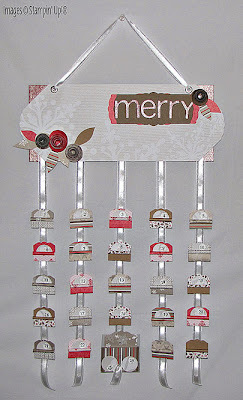 It's time to announce my December tutorial: "Wrappin’ Up and Counting Down to Christmas"! Start a fun family tradition this year:…make an advent calendar to count down to the holidays and then get ready to wrap things up by creating a gorgeous gift bag and gift card holders. When you see how fun and easy these are, you will want to make more to share with everyone! 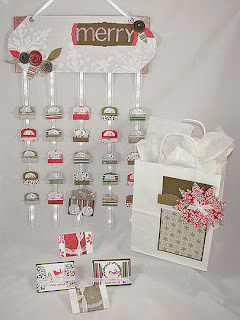 The project features unique uses for the Stampin' Up! Table Setting Bigz XL Die along with the Christmas Cocoa Specialty Designer Series Paper, Berry Christmas stamp set, Champagne Shimmer Paint, and jumbo eyelets. Re-create these projects using different Designer Series Paper and matching card stock for any holiday or season, birthday, or occasion. Make several gift card holders and gift bags with various Designer Series Paper styles using this tutorial and keep on hand; they are great for last minute gifts. Use the Autumn Traditions or Autumn Meadows DSP for fall or Thanksgiving, Cast-A-Spell DSP for Halloween, or try the Love Sparkles Simply Scrappin’ Kit for a fun Valentine’s Day project. 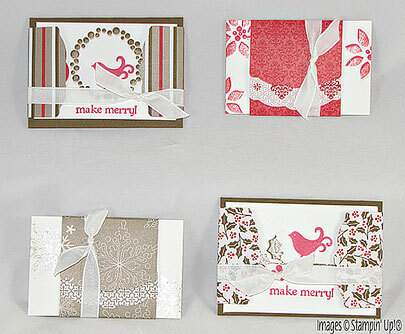 Substitute the Merry Moments Designer Series paper for a more traditional Christmas look. Use the Tall Tales DSP to make an alphabet sign for your favorite teacher or kid’s room using On Board Letters and a larger pocket for each letter. Use the Happy B-Day Simply Scrappin’ Kit to make a countdown for your next birthday and make matching gift bags and cards. 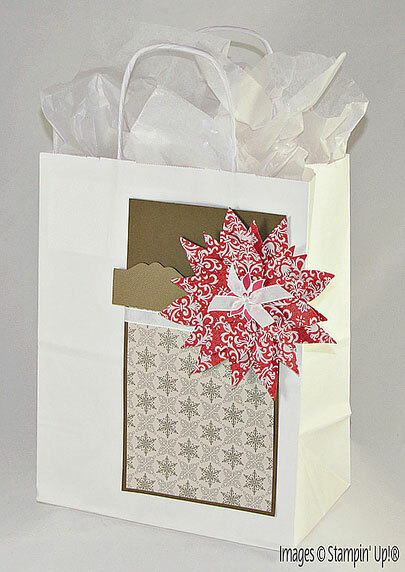 The Kit comes with self-adhesive die cut letters, so there is no need to colour chipboard! As my gift to you, receive this tutorial from me FREE this month with ANY size order or your class attendance in December.